For the last few years there have been problems with unofficial camping close to the road on the eastern side of Loch Lomond with much damage caused and trash left by vandals. This is not wild camping, though it has been called such. The Loch Lomond and the Trossachs National Park Authority is now calling it “informal camping”, which is a better description. The access legislation that gives a right to wild camping was not designed to include roadside camping but many have interpreted it as doing so. As the legislation only grants access rights to those who behave responsibly the people trashing the shores of Loch Lomond are clearly outwith the legislation anyway. In order to end the vandalism the national park is proposing byelaws to ban informal camping on the eastern shore of Loch Lomond close to the road. Once beyond the road end the byelaw will not apply. The vandal-campers don’t walk far and aren’t likely to cause damage far from the roadside (the national park says that informal research shows that most people will not go further than 29 metres from their car to camp – these are not backpackers!). Before enacting the byelaws the park is carrying out a consultation. See the information on the park website here. Having seen some of the damage caused to a beautiful and accessible place I am in favour of the parks proposals. I don’t think that byelaws to stop roadside camping are in breach of the access legislation or in any way a threat to real wild camping. In fact I think that dealing with this problem is a way to protect wild camping and reduce the likelihood of any blanket ban. It should also return the area to locals who currently have to put up with having their home vandalised and to visitors who really appreciate it and don’t cause damage. There has been some concern expressed on outdoor blogs (see Whitespider and Walkabout in the UK) that these byelaws could penalise backpackers and West Highland Way walkers who just want to camp quietly without leaving a trace. The national park proposals do address this legitimate concern saying “there is still a need to provide an informal camping experience in the area. The informal camp area(s) would provide basic facilities (toilet, firepit, bin provision) but it would still be a wilder camping experience than that of established formal campsites.” There are also commercial camp sites in the area too. And of course you can just walk beyond the road and have a real wild camp. Photo info. 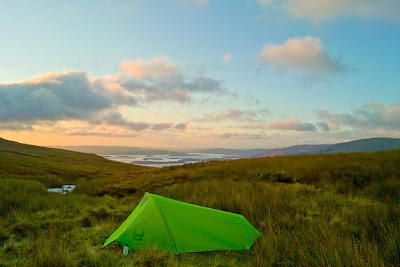 Two wild camps on the eastern side of Loch Lomond. Top: on the southern slopes of Ben Lomond overlooking Loch Lomond; bottom: in the woods close to the West Highland Way and Rowchoish bothy. Both pictures: Sigma DP1. Top 1/160@f8, ISO 200. Bottom 1/25@f5.6, ISO 400. Totally agree with what the park is doing. There are major issues around 'informal v. wild' camping that I'd like to see MCofS taking a lead on. Glen Etive is a case in point. One of the most beautiful glens in Scotland ruined by an almost total absence of camping/parking facilities and decent path network. I support 'pay to park' if the income generated is reinvested in to improve mountain amenities. Let's have a grown up debate. And great GPS article in TGO...this was a major step away from the Luddite approach to a true appreciation of the benefits modern technology can bring! The mess left by these campers is outrageous. As you say Chris, there are numerous hotspots around Scotland where similar messes are left y the mindless. This is a good initiative and should be supported wholeheartedly. Isn't this just part of the inevitable shaking down which comes from still relatively new legislation. Where people are camping at the roadside and leaving a mess behind them they're not observing the code on two counts. In those circumstances the authorities are bound to enforce the strict letter of the legislation and not run with a laissez-faire approach. Responsibility is the keyword and it looks as though it hasn't been exercised here. Personally I don't see anything sinister in this, and I'm as suspicious by nature as most. Thanks for the comments folks. Good to see people agree. Neil, with my MCoS hat on I can say that we are taking this seriously. 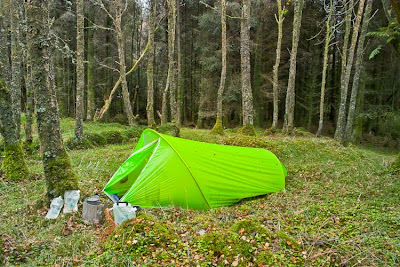 Hebe Carus, the MCoS Access & Conservation Officer, was quoted in the BBC News report yesterday (http://news.bbc.co.uk/1/hi/scotland/tayside_and_central/8503829.stm) and we publish a Wild Camping advice leaflet (http://www.mcofs.org.uk/assets/pdfs/wildcamping.pdf). Neil, and thanks for the comment on the GPS article. I am quite excited about the coming together of electronic functions in single devices. I'm in agreement too. Roadside 'parties' don't come under the banner of responsible camping, or wild camping. Doesn't the existing legislation enable the police to move these folk on? Mike, you make a good point there. Vandalism, hooliganism and littering are already offences. I guess the park want byelaws they can post and which their staff can enforce - though it shouldn't be up to rangers to do police work. I've seen the destruction and mess along the side of Loch Lomond myself and clearly something needs to be done but it's been going on for at least 20 years and there are sufficient laws to have nipped the problem in the bud a long time ago had they been enforced. My concern with the proposed bylaw is that like a sign warning of an accident blackspot the problem is simply moved a few miles up the road. In the event that the proposals come to pass who is going to enforce them? park rangers can certainly ask people to move but how effective one ranger will be at enforcing the law on half a dozen drunken vandals is a matter of concern. A ranger is unlikely to have any power of arrest and runs the risk of assault in attempting to enforce (if indeed he can actually enforce) the bylaw, in fact any attempt to forcibly remove illegal campers could result in a counter claim of assault. It seems all too common these days to introduce more laws rather than enforcing the existing ones. Having said that I hope whatever course of action is taken is successful. This is a real problem and not just around Rowardennan. Loch Lubnaig, loch Earn, Kinloch Rannoch, the golf course road at Braemar (that's just off the top of my head) - these places seem to have become almost accepted as "camp" sites. While they may not always be intimidating and loutish, they are still (to my eyes) universally unpleasant and off-putting. I hope this initiative will, if nothing else, reiterate the need for education regarding leaving no trace and, where necessary, nudge the appropriate authorities into enforcing the current "legislation". I accept this last point is probably the most impractical. How does Strathclyde police prioritise a pub brawl in Glasgow against a few drunken teenagers doing not much more (to their mind) than blowing off a bit of steam? I wish the NP authorities luck with this. You have to remember Loch Lomond for the vast majority of Scotland’s population is the closest ‘great outdoors’. What needs to be done is the minority that are ruining it for everbody to be taken to task. It seems to be the modern day cop out these days – “if a minority is ruining something for the majority, then lets just ban everybody!” It’s lazy and our everyday freedoms are slowly being taken away. "There has been some concern expressed...."
Sorry John, yours is indeed an info piece. It's Darren who expresses concern. I agree that this step is inevitable given the continuing problem. I agree completely with the NP's decision, but I note that there has now been a call by MSP Murdo Fraser to extend this to Loch Tay, L Rannoch and L Tummel. I think we need to be very vigilant here lest there is an attempt to also restrict wild camping. I know we may be a long way away from anyone considering this but, like wind turbines, once the ball is rolling it's hard to stop. I think the proposed byelaws on that stretch of Loch Lomond are there to deal with an exceptional problem. I certainly wouldn't want them extended to areas without such problems. Alastair, a problem is that the irresponsible campers and the damage and rowdiness associated with them would put off most resonsible informal campers anyway. I wouldn't want to camp along that stretch of the loch shore (last time I was there I was horrified at the mess - and camped wild at the two sites pictured, well away from the vandals). A basic informal camp site along with the two commercial sites is an adequate solution in my view. Anyone who wants to camp wild only has to walk a short distance beyond Ptarmigan Lodge. Could wild camping be described as informal ? I'm assuming that the informal site is to be provided to meet the needs of the informal campers so that they won't go elsewhere. Have these informal campers been asked if they would use such a site ? Will informal campers be aware that they can camp several hundred metres away from the roadside and not be asked to move, provided they are not breaking the law? The happiest solution for all, I think, would be if these informal campers continued to return to Loch Lomond but behaved acceptably. I would hope this consultation will include dialogue with the informal campers. Alastair, I agree the best solution would be that the informal campers behaved acceptably. I'm afraid I don't think this is likely with many of them. The point of calling roadside camping informal camping is to distinguish it from wild camping, which takes place well away from roads. Unfortunately, I think wild camping can be described as informal. I don't particularly see anything wrong with roadside camping. The problem is the anti social behaviour of these people. Like anywhere else, where anti social behaviour is present, the police deal with it. So, I do not agree with the proposed bye laws. Pike anglers are backing Ramblers Scotland in their campaign against new camping by-laws proposed for Loch Lomond. Park authorities claim tighter controls are needed to protect the Bonny, Bonny Banks from litter louts and vandals. But the Pike Anglers Club of Great Britain (PAC) fears a ban would stop responsible anglers enjoying their sport around the loch shores. It's worried similar by-laws could also stop visiting fishermen from bivvying up around lochs Tay, Tummel and Rannoch. "The by-laws would deny us the right to enjoy the countryside, as our members have for generations," said PAC secretary Graham Slater. "It's wrong to punish the majority because a minority offend." Trossachs National Park has announced a 12-week consultation on whether to stop "informal camping" along a 14-mile stretch of Lomond's eastern shore. MSP Murdo Fraser is calling for similar bans to be imposed along the bans of lochs across Highland Perthshire. But the 2500-strong PAC says any bans would be contrary to the spirit of the Land Reform Act. Its leaders have written to the Ramblers, expressing support for their campaign. They're also seeking urgent talks with National Park authorities. "What these proposed by-laws fail to do is draw a line between the responsible behaviour of a group of anglers bivvied up around a loch, enjoying a pastime which is completely in tune with the philosphy of the National Park, and those who leave litter, light fires and behave like hooligans," said Fife-based Mr Slater. "A blanket ban makes as much sense as banning driving because a minority of motorists speed, drink drive or cause crashes." Loch Lomond is one of Scotlands most historically-important pike fisheries, which has been enjoyed by pike anglers from both sides of the border since Victorian times. Tommy Morgan's 47lbs 11oz pike, landed from the loch in 1945, still holds the Scottish record. The largest pike ever to be found in the British Isles was discovered dead on its banks, near the River Endrick, in 1934. The head of this monster, estimated to weigh 70lbs, is now in Glasgow's Kelvingrove Museum. Consultation over the by-law changes ends on May 3. I run a small bed and breakfast in loch lomond and know all to well the problems cuased by the informal campers. More than once I have had to help lift empty beer cans and bottles. The large majority of people who visit the area treat it with respect so it would not be correct to punish the majority, we need to find a way to stop the minority. My bed and and breakfast can be found on the loch lomond hotels website. No doubt I am not the only property owner who has had problems with the unruly.